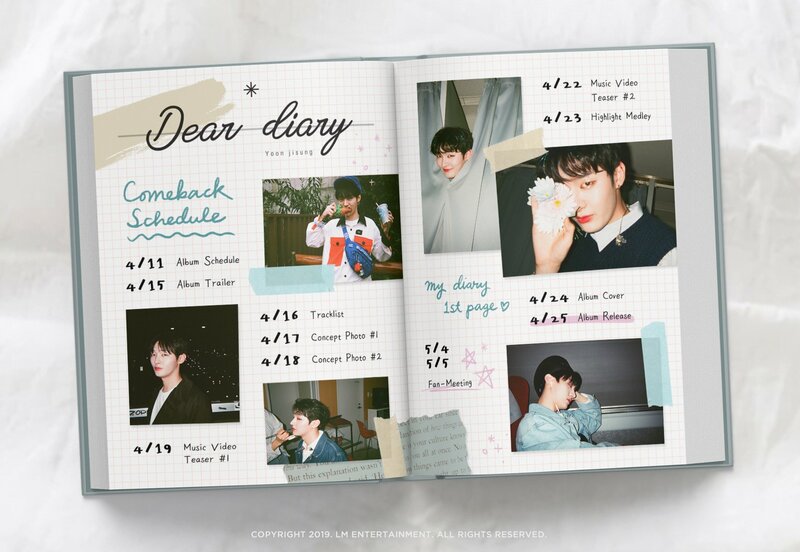 On April 10th, Yoon Jisung released his schedule announcement for his special album ‘Dear Diary‘. It will be released on April 25th. This is his first comeback since his solo debut this year with title track ‘In the Rain’ and first mini album ‘Aside‘. Check it out below! Matching the title of the special album, the image teaser contains playful pictures of Jisung in his daily life. For example, he is hiding behind a curtain, sleeping on a train, and enjoying a meal. This hints that his first comeback may be more personable as he is releasing it before his enlistment sometimes this year. Jisung will soon release an album trailer, track list, two concept photos, two MV teasers, highlight medley, album cover and finally his album. He will also hold fan meetings on May 4th and 5th. Stay tuned! Are you excited for Jisung‘s first comeback with ‘Dear Diary‘? Let us know in the comments below. Yoon Jisung releases more teasers for his upcoming solo debut! Yoon Jisung announces his fanclub’s name and track list for upcoming solo debut album!